Oh 30-pip filter, how I love you. Thanks to you, I have managed to avoid another major whipsaw as EUR/USD bounced around 1.3750 and 1.4000 this week. As you can see, the HLHB system produced a valid signal in Tuesday when the two EMAs did a bearish crossover. 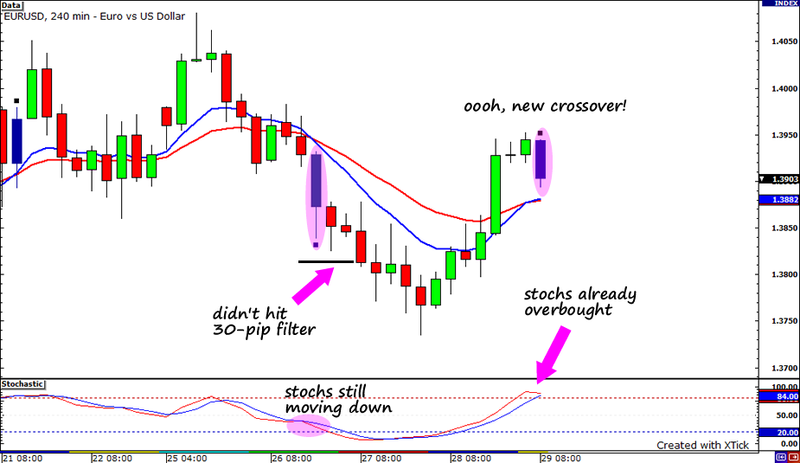 Stochastic was not yet oversold, which means that I should enter long if the following candle went 30 pips below the low of the crossover candle. Luckily, the 30-pip filter was not triggered because the move down eventually proved to be a whipsaw when price found support at 1.3750 and rallied all the way above 1.3900. So, no HLHB system trades today, but no losses either. Doesn’t mean I’m sad though! In fact, I’m particularly glad right now because I am in the middle of a winning trade. If you don’t know what I’m talking about, take a look at my EUR/USD trade idea two days ago. I just hit my first profit target, and I think it still can rise further. Let’s see if my second profit target gets hit! What a week it was in the forex markets! Dollar action was all over the place, as it seemed like it was poised to make some serious gains. It was gaining across the board and it even had some people thinking that we were going to see a major correction! Instead, we saw a massive dollar sell-off yesterday and it practically gave up almost all of its gains! What a teaser! It actually reminded me of… well, me! Haha, sorry boys, but that’s just how girls play! In any case, it seems that the markets are still focusing in on further stimulus measures from the Fed. As long as this continues, I think traders will still be reluctant to take any long-dollar positions. As for my trading, I’m just trying to hold my excitement in as it looks like my EUR/USD trade is panning out pretty nicely. Woohoo!